Home › Publications › Sweet! Among the earliest applications for polymer in both Europe and America was by miniaturists who created tiny accessories to decorate doll houses. In American, Esther Olsen wrote a number of how-to pamphlets for this audience. 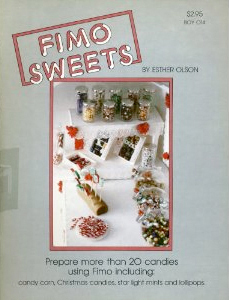 Fimo Sweets, a 14 page booklet, was loaded with detailed black and white photographs showing how to make more than 20 different candies including candy corn, Christmas candies, star light mints and lollipops. This publication likely inspired many early polymer jewelers to employ canes of edibles, like lemon and watermelons slices, as part of their designs. Other healthier replications like fruits and vegetables sprouted up too. The original edition, published by Boynton & Assoc. in 1983, appears to be among the very earliest publications we could find on polymer. The Racine Art Museum’s commitment to polymer is also exceptional. Not only have they sought out the finest exhibition pieces in polymer, they have also committed to preserving archive materials. These historically important samples and print materials will become a resource for future art historians doing research in the field.